Rangers of Oblivion is now open for pre-registration in the run-up to launch, as YooZoo Games prepares to release for Android and iOS in early 2019. In Rangers of Oblivion, players enter an incredible 3D fantasy RPG as they team up with friends or go at it alone to explore Malheim, a vast sprawling world full of the Monsters that inspire the darkest stories and the greatest of heroes. 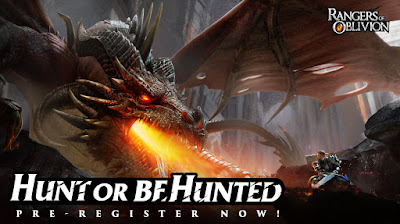 Create your own character in this MMORPG monster-hunting game and become one of the Rangers; a faction dedicated to defending the land of Malheim from all manner of fearsome monsters. You can take on and master six unique weapon types: Greatsword, Lance, Longbow, Twin Blades, Armored Gauntlets, and Staff. Each has a distinct combat style, skill set and offers different attributes. Forge stronger weapons and armour by crafting the spoils of the hunt, upgrading your weapons to face tougher monsters. With more than 10+ game modes that enable players to test combat skills and take on survival challenges, catch wild horses, search for hidden treasure, go fishing, and cook exotic dishes and more, Rangers of Oblivion is the ultimate monster hunting playground for mobile devices. Pre-registration is open now on the official website, while Google Play Beta begins on 5th December - register now with Google Play.